Adult First Aid This course is designed to meet the training requirements for Business/Industry, OSHA, ALFs & Nursing homes. Subjects covered: Primary Survey, Bleeding, Broken Bones, Shock, Heart/Stroke emergencies, Seizures, and Heat & cold emergencies, more, for adult victims. This course meets the guidelines for DOT, NHSTHA, US Coast Guard, and is approved by: Department of Elder Affairs to meet the training guidelines for ALF/Nursing home professionals. Biological Warfare Agents This course is designed to meet the training requirements for medical professionals, & CNA's working in the ALF & nursing, or skilled nursing homes. Subjects covered: The purpose of this course is to inform medical professionals to the VERY REAL possibility of viral or bacterial agents that can be used as a weapon at any time to incapacitate or kill large masses of people. Body Mechanics This course is designed to meet the training requirements for medical professionals. Subjects covered: Back injuries make up half of the compensable disorders among people who work in hospitals and long-term care facilities. The same is likely to be true for home health. The real number of injuries is higher an the figures indicate, because not all injuries are reported. Proper handling of your body can prevent major & minor injuries to you and your patients/residents. 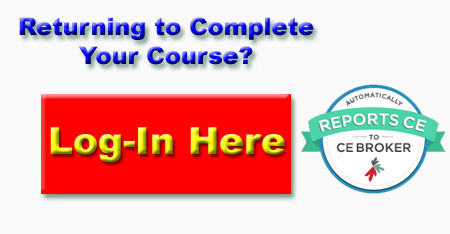 Bloodborne Pathogens This course is designed to meet the training for OSHA requirements for business/industry. If you hold a professional license and your license board requires an HIV/AIDS course to renew, this course will meet that requirement. Recognizing Impairment in the Workplace and Communicating with Cognitively Impaired Residents: This course is designed to meet the training requirements for medical professionals and meets the requirements for the Florida Board of Nursing Recognizing Impairment in the Workplace required course. Subjects covered: A cognitively impaired resident requires special techniques for assisting and responding to their needs. Understand the how to deal with cognitively impaired resident. Understand the different guidelines for dealing with such residents. Domestic Violence Awareness This course is designed to meet the training requirement for most licensed individuals in the state of Florida. If you hold a professional license and your license board requires a course in domestic violence to renew, this course will meet that requirement. Subjects covered: Physical violence, Power struggle, Leaving and escalation of violence, stopping the violence, Profile of an abused spouse, verbal and emotional abuse, Intervention, getting help.